Market Fisheries held a talk and taste session at Simmons Quay, Rock Channel, where their premises are tucked away at the back, last Saturday, February 25. 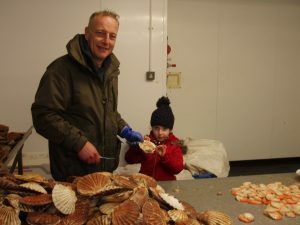 This was all part of Rye Bay Scallop week, which ran from Saturday February 18 until Sunday February 26, with Market Fisheries being one of the suppliers to the various and diverse events. Trading for more than 35 years, Market Fisheries are indeed the people who know and understand their daily catch. The day-caught scallops were in a great pile, being shucked by Russell and Charlotte Drew in the back of the shop, with a wonderful display of other fresh fish at the counter at the front of the shop. All were named and explained to the ignorant. Tastings of scallops with whisky were available, with small blue spray bottles of the whisky infusion for people to buy and try! The peat flavour in the whisky enhances the scallop and gives a taste much like honeydew melon, some people say. On enquiring how the scallops are best prepared, it seems that chopped bacon fried in a pan and scallops popped in for a couple of minutes, is the preferred method of those in the know. Simple. In addition to the scallop talk and tasting, it is worth remembering that Market Fisheries is highly regarded for its catch, both locally and wider afield. It is well worth making the trip to find it, to buy fresh from the sea.